Take back your mornings and still leave the house looking like a star. 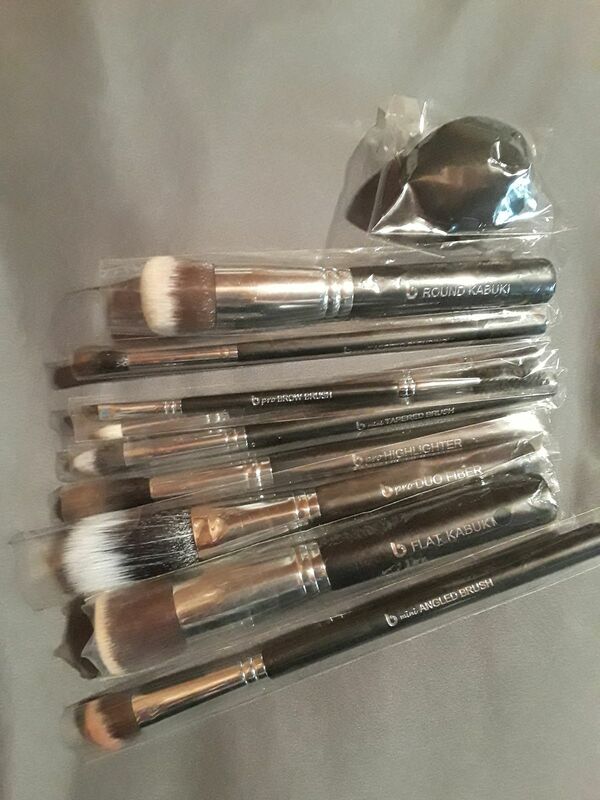 Get rid of the chaos in your makeup collection with this set of expert beauty brushes for a full face application. Everything you need to create subtle and sweet looks, to bold and beautiful looks, can be accomplished with these best-selling brushes. Includes Beauty Junkees Top 10 Makeup Tools – 9 Makeup Brushes, and 1 Makeup Sponge. Flat Top Kabuki: Perfect foundation brush for covering blemishes, age spots, or other skin irritations using medium to heavy coverage. Round Kabuki: This high quality makeup brush is the perfect complement to mineral makeup and powder application. mini Tapered Kabuki: Designed to provide coverage in hard to reach areas, such as the eyelid, corner of the eye and under eye, for a complete flawless finish. mini Angled Kabuki: Soft enough to use as an eye blending brush, yet dense enough to use as a foundation blending brush. pro Tapered Blending: Designed for applying and blending a transition color base shadow into the crease of the eyelid for a soft finish. pro Pencil: Best used for smudging liners or applying shadow along the top and lower lash line, creating a smokey effect. Also great for defining the outer V or the crease. pro Brow: Has a narrow angled bristle head designed for shaping and defining eyebrows, with a dual end Spoolie Brush for grooming and blending. Works with all fillers. pro Duo Fiber: The perfect brush to use when applying your favorite bronzer. Long plus short bristles for feather like application that allows for buildable color and a sheer, flawless finish. pro Highlighter: Best used when applying highlighter to narrow facial features such as the bridge of the nose, tops of the cheekbones, the cupid bow and above the brow. Soft bristles with a small taper point for the perfect application. Black Teardrop Makeup Sponge: Best used with liquid makeup, such as any liquid primers, foundations, concealers, eye shadows, or blushes. You should use light pressure when sweeping your brush across your cheeks. The bristles for any application should not bend when applying your product. Lina M. Reviewed by Lina M.
Loved these brushes. Must have!!! These brushes are just like named brand brushes. I would buy more. Hi Lina, Thank you for taking the time to give us your feedback! We appreciate you and your business! I am happy to hear that you love your new brush set! Yes, we've been told that our brushes are comparable to some big name brands but NOT our price tag. Colleen L. Reviewed by Colleen L.
I received my brush set and I can't stop talking about them. Love it! Lizana P. Reviewed by Lizana P.
Good quality. Great price. The set includes all the brushes you need. Really pleased. I honestly wasn't expecting much when I ordered these because the price is so low, but dang I was pleasantly surprised. They are so incredibly soft & work as well (if not better) than the higher end brushes I've tried. I love them so much I'm ordering another set just so I can have backups. If you're on the fence, DON'T BE, buy them & you will not be disappointed. Silvia B. Reviewed by Silvia B. Look includes peach & brown mattes with pearlized copper & gold shades. This 2 piece holder organizes your brushes and protects during travel.